Slim fit. 150gsm Performance Polyester Pique. Forward position side seams with contrast insert. French seam shoulder construction for comfort and durability. Contrast back yoke with embroidered SS logo. Forward side seams with contrasting insert. Embroidered Surridge logo on right chest. 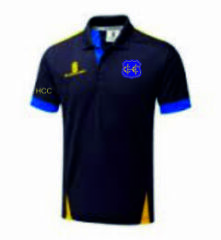 Club badge embroidered on left chest opposite Surridge logo. Initials embroidered on right arm.